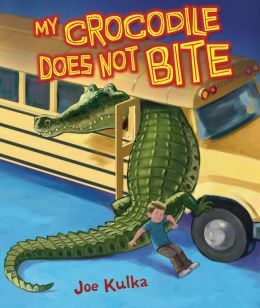 My Crocodile Does Not Bite is a fun picture book for children ages 5-9 and second grade readers should be able to master reading the story independently with some practice on the difficult words like “obviously” and “disagreement”. Although not all the words are on the list for second grade readers, the text is easy to sound out and second grade readers will be successful because the plot will keep them engaged. The book offers many types of discussions when read in the classroom setting. The conflict resulting in bringing a crocodile to school is funny yet can be compared to other activities where students experience conflict and emotions offering many subjects to discuss. The story also allows teachers and parents who homeschool the second grade reader a great opportunity to discuss fiction versus nonfiction, make believe and truths, and what is silly and what is dangerous. Putting your head in the mouth of a real crocodile for instance is dangerous but in the story it is part of the truth that the pet doesn’t bite; the crocodile swallows Cindy Lou whole instead. And the story can encourage second graders to dream big when writing their own story, another activity that can enhance reading a book like this. The illustrations are wonderful and give the second grade reader information on the page to encourage reading the text. They also add additional comprehension for the second grade reader who may get caught up in the words and forget the rest of what was just recently read. My Crocodile Does Not Bite is a fun book to add to any second grade classroom library or elementary school library shelf. It will keep kids reading. Overall the book is entertaining for the second grade reader and will help to encourage them to use imagination and comprehension skills when talking about the story.